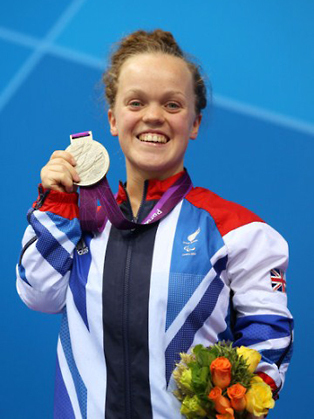 Eleanor ‘Ellie’ Simmonds is a four times Paralympic Champion and current multiple world record holder. Ellie shot to fame when she became the youngest Briton to win an Olympic or Paralympic medal at the age of 13 years and 9 months. This was the start of a string of firsts for Ellie as she went on to become the youngest winner of the BBC Young Sports Personality of the year in 2008 and then the youngest recipient of the MBE at the age of 14 years. Since her meteoric rise into the public eye Ellie has continued to dominate her sport, winning 10 World titles, five European titles and breaking eight World Records along the way. That dominance continued into the London 2012 Paralympics where she won four medals and broke two world records. Her gold medals were won in the S6 400m Freestyle and SM6 200m Individual Medley. Ellie won silver in the S6 100m Freestyle and Bronze in the S6 50m Freestyle. In the lead up to London 2012 Ellie became the poster girl for the Paralympic Games and her success makes her the most recognised Paralympic athlete in Great Britain. Eleanor’s disability is classified as Achondroplasia dwarfism. She started swimming at the age of 5 and started competing against able bodied children at the age of 8. At 10 years old Ellie’s talent was spotted at a disability event and she was entered onto the British Swimming talent program and worked her way through to be selected as the youngest member of a senior British swimming squad for the 2006 IPC World Championships at 12 years and 3 weeks. Since bursting onto the scene at the Beijing Paralympics, Ellie Simmonds has captured both the hearts and minds of the British public balancing her stardom with her schoolwork and training. Ellie’s reputation as a world class athlete has been secured with fantastic performances at London 2012. She followed up her sensational Paralympics with an equally fantastic World Championships in Montreal where she came home with three gold medals, a bronze and a world record cementing her status as Britain’s golden girl.